at Kenwick Park GC, Louth , Lincs.Thursday Sept17th. Northamptonshire Seniors took a league position advantage of six points to four points into this Anglian League decider. Last season, the league was decided with the last shot of the day at Northampton GC also against Lincolnshire. After very heavy rain in the early part of the week, it was decided by the Captains to introduce placing. 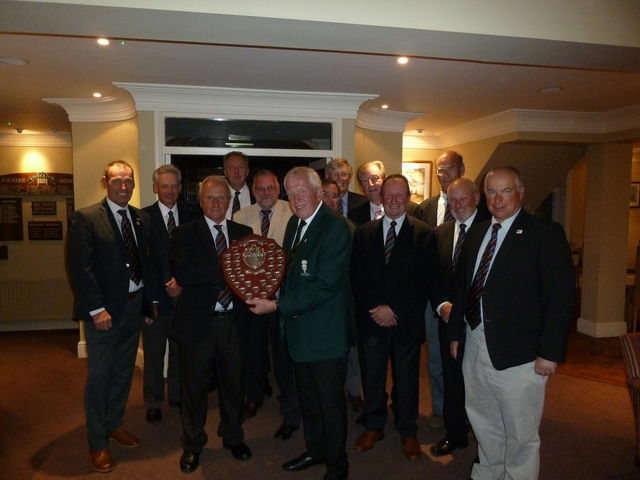 Eight of the Seniors Team played a practise round on the Wednesday and stayed overnight in Louth. The morning foursomes was very tight, resulting in two and a half points each. It had been decided that our new County Champion, Ian Kerr of Peterborough Milton should have the honour of leading the team in the afternoon. Having had a brilliant season, Ian did not disappoint winning two and one. What followed was quite incredible. Northamptonshire lost the next five matches by significant margins, then won the last four by ever increasing margins to secure the half. This half secured the Anglian League for the second successive year. This was a combined Anglian League and Midland League East match (10 players to count). Lincolnshire won the Midland League East match (all 12 players to count) by a single point. We started off the season with our first ever coaching sessions, which helped to secure the great team spirit we have amongst all of the players. New players have been welcomed and have performed well, and hopefully enjoyed the experience. Can I thank all of the players who have contributed so much in time and effort this season. You have made my job a real pleasure.